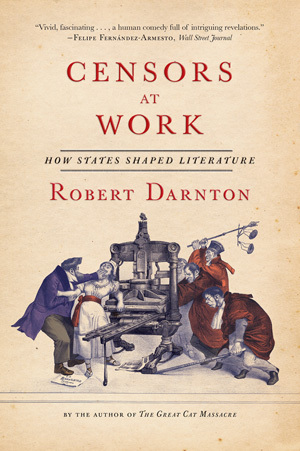 With his uncanny ability to spark life in the past, Robert Darnton re-creates three historical worlds in which censorship shaped literary expression in distinctive ways. In eighteenth-century France, censors, authors, and booksellers collaborated in making literature by navigating the intricate culture of royal privilege. Even as the king's censors outlawed works by Voltaire, Rousseau, and other celebrated Enlightenment writers, the head censor himself incubated Diderot’s great Encyclopedie by hiding the banned project’s papers in his Paris townhouse. Relationships at court trumped principle in the Old Regime. Shaken by the Sepoy uprising in 1857, the British Raj undertook a vast surveillance of every aspect of Indian life, including its literary output. Years later the outrage stirred by the British partition of Bengal led the Raj to put this knowledge to use. Seeking to suppress Indian publications that it deemed seditious, the British held hearings in which literary criticism led to prison sentences. Their efforts to meld imperial power and liberal principle fed a growing Indian opposition. In Communist East Germany, censorship was a component of the party program to engineer society. Behind the unmarked office doors of Ninety Clara-Zetkin Street in East Berlin, censors developed annual plans for literature in negotiation with high party officials and prominent writers. A system so pervasive that it lodged inside the authors’ heads as self-censorship, it left visible scars in the nation’s literature. By rooting censorship in the particulars of history, Darnton's revealing study enables us to think more clearly about efforts to control expression past and present.